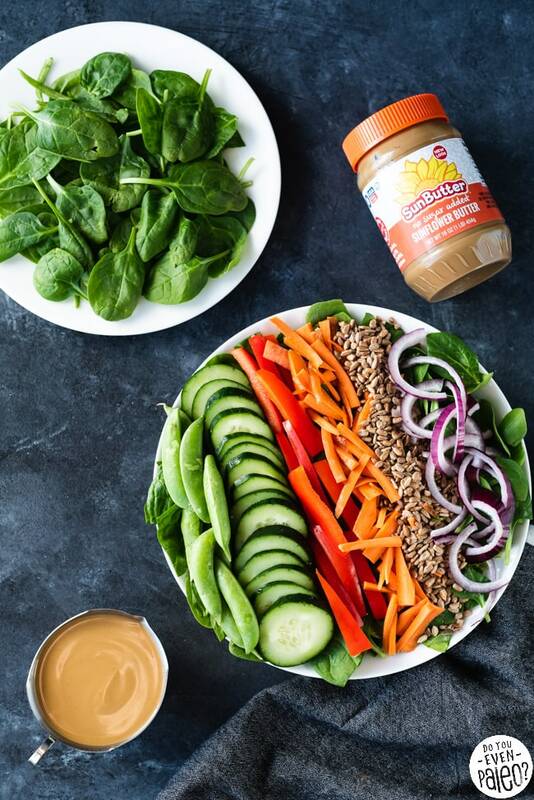 This Chopped Spinach Salad with Sunbutter Vinaigrette recipe and the accompanying post are sponsored by Sunbutter®! All experiences and opinions are my own. The best part of salads — the visual appeal. 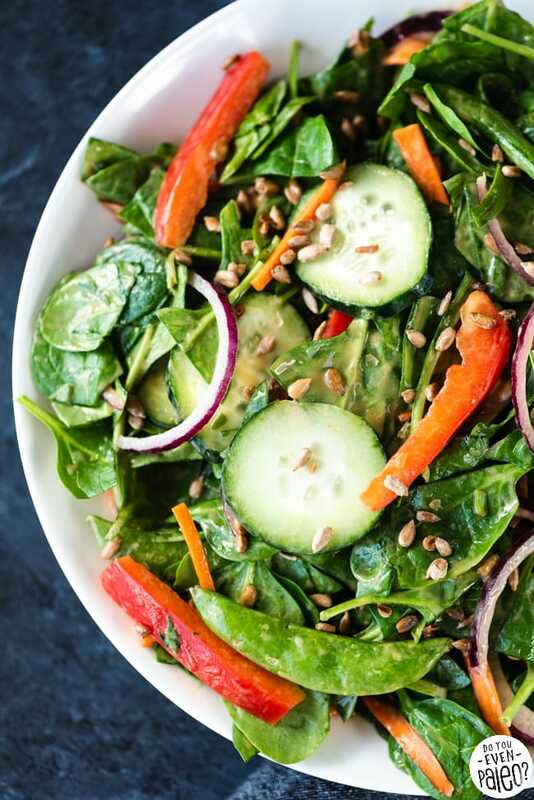 Don’t you just love the colors in this Chopped Spinach Salad? Read back through some of my old posts, and you’ll discover that I hold some pretty strong beliefs about food. Tacos are amazing, plantains are the most versatile thing on the planet, and toppings, mix-ins, and dressings are what make salads PHENOMENAL. Chopped salads are the PERFECT vehicle for that last belief. Sure, you start with a base of greens. 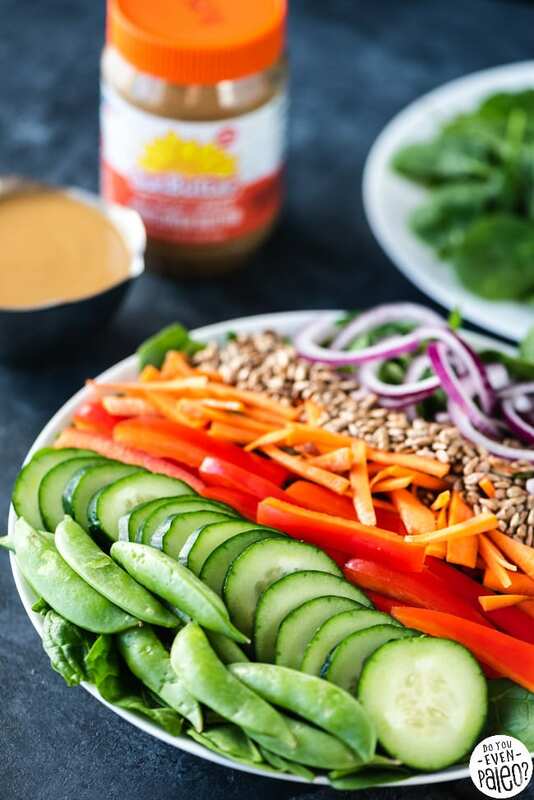 But then you pile on pretty rows of colorful toppings and pair with with a bangin’ dressing. And that’s precisely what I have to offer you today. 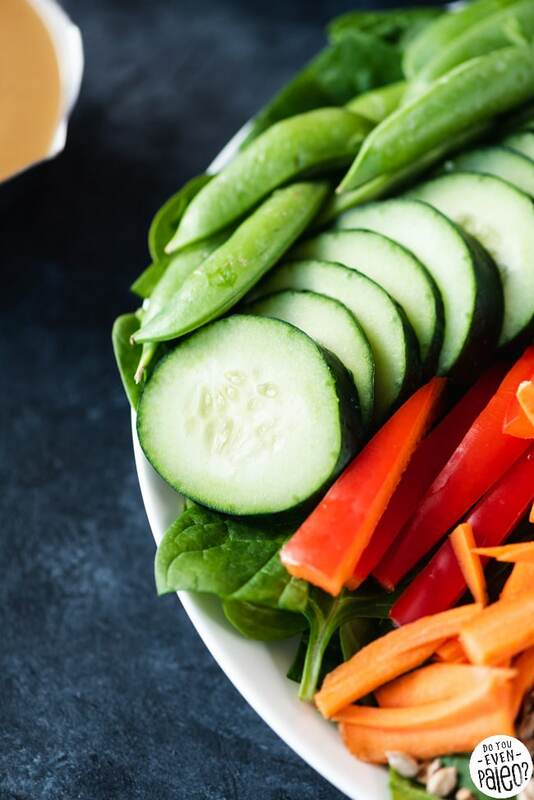 A whole lot of wonderful veggies with an unbeatable Sunbutter® vinaigrette! Not gonna lie, I’m one lucky blogger to get to work so closely with Sunbutter! This well-recognized brand of sunflower seed butter calls Fargo, ND home — just like me! Sunbutter quickly became my peanut butter alternative when I went paleo. Their sunflower seed butter is free from the top 8 food allergens and made from US-grown, non-GMO sunflower seeds. The flavor is closest to PB compared to any other nut butter, and I swear Sunbutter makes the creamiest dang sunflower seed butter ever. 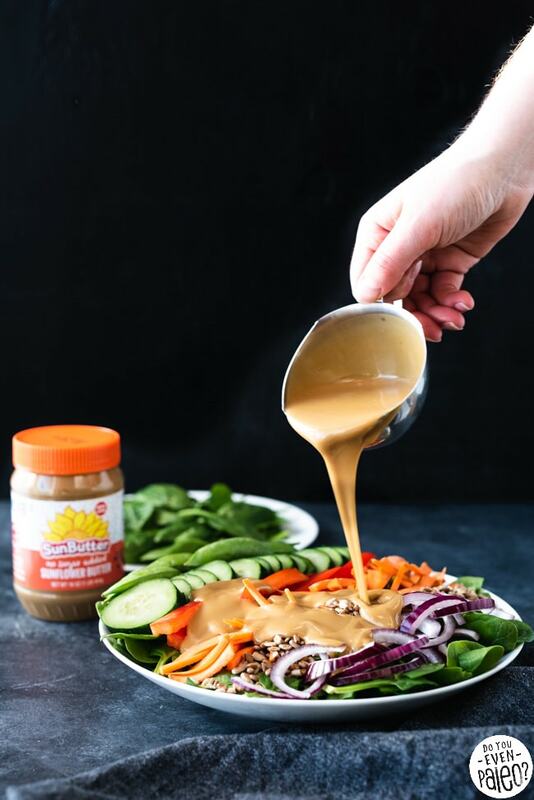 And that makes Sunbutter a perfect match for salad dressings, where creamy is king! 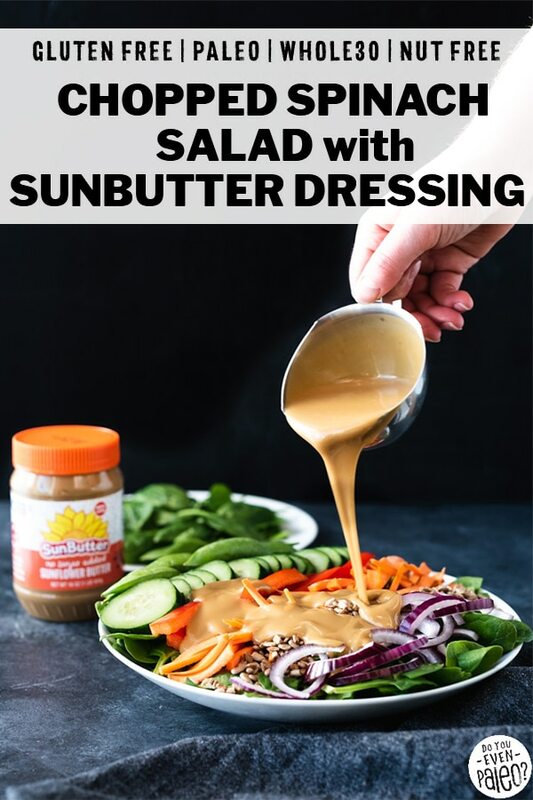 Unlike other Sunbutter dressings I’ve made in the past, this one’s a vinaigrette. That means Sunbutter isn’t necessarily the dominant flavor, but it still hangs out in the corner, a little more subdued. 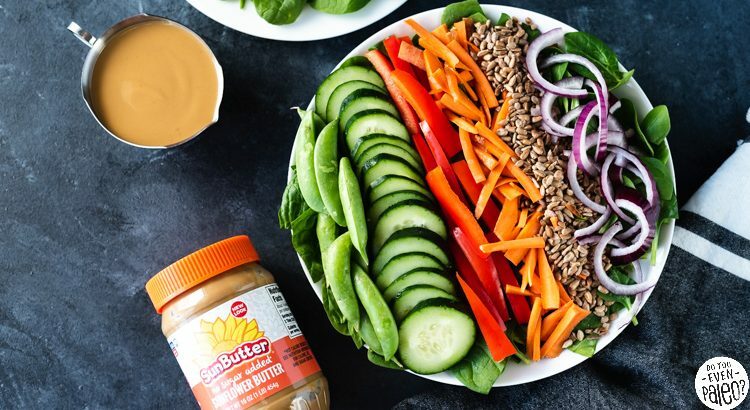 The Sunbutter vinaigrette is a perfect match for this chopped salad, which already has a myriad of different flavors going on thanks to red bell peppers, carrots, sugar snap peas, and toasted sunflower seeds. Typically, I make very hardy salads. You know, salads that can hang out in the fridge for a couple days and still be eaten. Because of that, I find it necessary to warn you that this salad will NOT keep for more than a day in the fridge. The spinach gets too soggy — trust me, you won’t want soggy spinach. But it is a BIG salad, so be prepared to eat it once you add the dressing! Making this recipe? Click here for $1 off a jar of Sunbutter! You can print this coupon twice a month and use it at your fave grocery store. 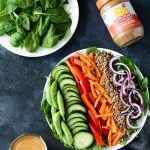 Crunchy and colorful, this Chopped Spinach Salad with Sunbutter Vinaigrette recipe makes a plentiful and nutritious side dish. Creamy No Sugar Added Sunbutter is the perfect ingredient for this paleo and gluten free recipe! 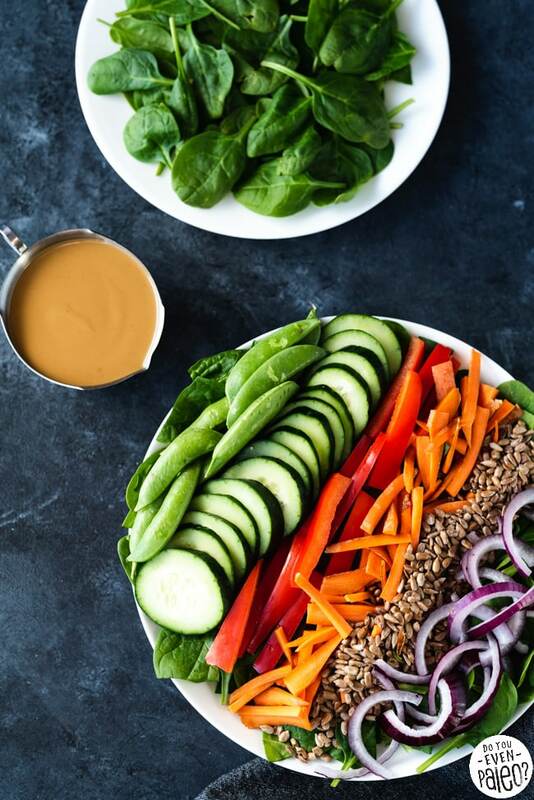 To make the vinaigrette, add rice wine vinegar, powdered ginger, coconut aminos, raw honey, olive oil, and Sunbutter to a large measuring cup. Whisk gently until fully emulsified. Set aside while you prep the salad. Add the spinach to a large salad bowl. Arrange shredded carrots on top of the spinach in a strip. 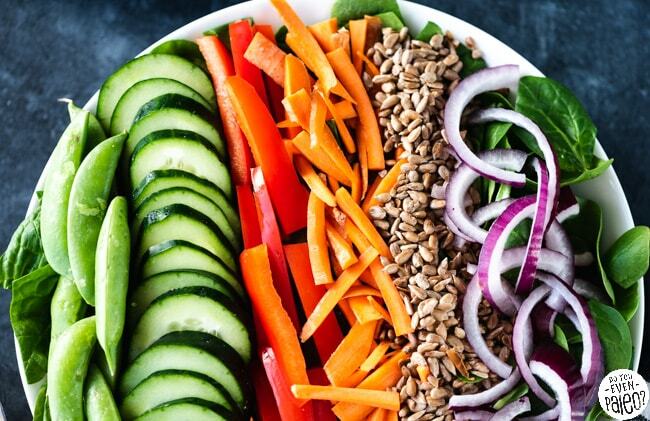 Repeat with red bell pepper, red onion, sugar snap peas, cucumber slices, and toasted sunflower seeds, creating rows of each across the top of the spinach. 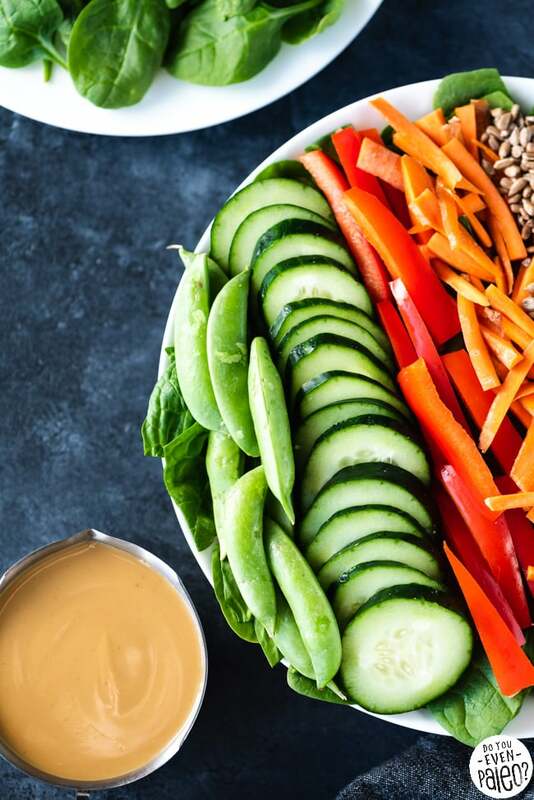 Serve the salad undressed, with portions of vinaigrette so each person can drizzle their serving with dressing themselves. Alternatively, if you aren’t worried about the presentation, toss the whole salad in the Sunbutter vinaigrette just before serving. Don't subscribe All Replies to my comments Notify me of followup comments via e-mail. You can also <a href='https://www.doyouevenpaleo.net/comment-subscriptions/?srp=6834&srk=87505361eee98908ddf6ccb8681f50d6&sra=s&srsrc=f'>subscribe</a> without commenting.